There’s been a persistent claim that EU membership costs the UK £350 Million per week. The snag is that it doesn’t, and the experience of Norway highlights the fact that there would be no big savings to spend elsewhere if we left the EU, but there would be big losses. The “£350 Million a week” figure for the cost of EU membership has been very persistent. 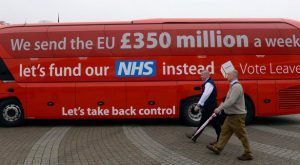 It is even on the livery of the Vote.Leave battlebus (which just happens to be made in Germany). There have been claims that this could be spent on all sorts of things, such as the NHS or British farming. But things are not quite what they seem. It is funny how they focus on the NHS: it is a great British achievement and something to be proud of, but it is a cynical ploy to suggest that leaving the EU would help, when the numbers don’t stack up. Though the NHS would be in trouble if it were not for the people it employs from other parts of the EU. Is it really £350 million a week? This was originally negotiated by Margaret Thatcher, who successfully argued that we were paying in too much. The problem was that British farming was sufficiently efficient to mean we were getting less back on the Common Agricultural Policy than other nations. A sad indicator of news reporting in the UK was that, when reform of the Common Agricultural Policy meant that the gap narrowed it was spun as a reduction in our rebate, where in fact the rebate went down because there was less need for it. If we left the EU we would no longer receive this money. EU money spent here: this is on support for British farming, and support for deprived regions and communities in the UK. If we left the EU we would still need to spend money on farming and on deprived regions and communities, so this money would not become available. Money to business: through a raft of programmes to support training and competitiveness. We wouldn’t have to spend this money if we left, it would harm our economy if we didn’t. Overseas aid: this is not just about generosity — it helps stability for us if we can put aid into places which are in trouble, both to remove the need for people to migrate and the potential for them to become involved in terrorism. Working with our European partners multiplies the effectiveness of this money and it is not in our interests to cut it. So what of the money we do send? There is a close parallel with Norway, which voted to stay out of the EU by a narrow majority (52.2%) in 1994. The single market was and is a good idea, but a minority of people would lose out, so all the nations involved pay money in to help those areas and to help with the cost of democratic oversight. Norway pays almost very close to the same amount per person for access to the single market as the actual sum the UK sends to Brussels (£350Million minus what we get back). The upshot is that, if we left, we would be sending to Brussels pretty much what we send now, with one crucial difference: we would have lost our ability to alter the rules for the single market. For Norway this is a problem, but as a small country, they would have relatively little influence. The UK has around fifteen times Norway’s population and a correspondingly larger influence over the rules for the single market. Why on earth would we want to lose that influence? Brexit campaigners suggest that leaving would assert our independence: the reality is that it would give us freedom to do what others say. It is interesting that the Norwegian Prime Minister, Erna Soldberg, has been encouraging the UK to remain in the EU. It is also interesting to see how closely Norway tries to co-operate with the EU on foreign policy: they see working closely with the EU as in their interest. Why would we want to leave and then work closely with the EU, when we have more influence as a member of the EU? PostScript: In July, Bruegel.org provided this summary of what EEA countries pay for access to the single market which puts some flesh on the idea of our net contributions if we left the EU and joined the EEA. It implies that we would not end up paying noticeably less than now.